What will a boat builder do when he cannot obtain mahogany that is wide enough? He takes his sawmill and goes to the woods. 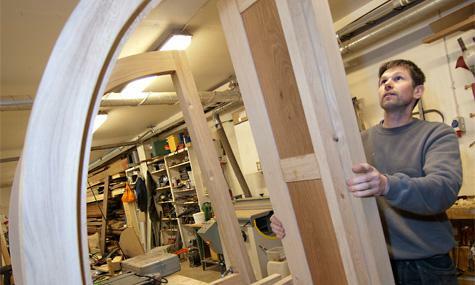 ”In the Swedish woods there are several interesting sorts of wood, like oak, elm and ash,” says Johan Nilsson, one of three boat builders behind the company Båthantverkarna (‘The Boat Craftsmen’ in English) in Stockholm. Johan shares trademark and premises with Greger Andersson and Mattias Malmros. They each have their own business but cooperate through the partnership called ‘Båthantverkarna’ (‘The Boat Craftsmen’). But the thing that unites them most of all, is the passion for boats, wood and craftsmanship. ”This is nothing you get rich by, but at the same time it is a privilege to be able to earn your living from your big passion,” says Johan, and both his colleagues nod in agreement. 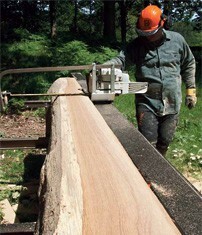 Much of the wood used in the business, is sawn in a Logosol LM40 band sawmill. 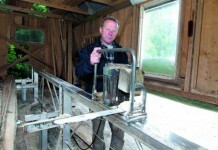 For larger dimensions they use the BigMill LSG, which stands leaning against the wall in the workshop. 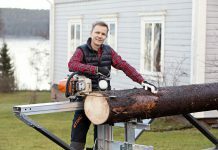 ”I was involved in the building of the East Indiaman Götheborg, and then we often used that type of sawmill,” says Mattias. 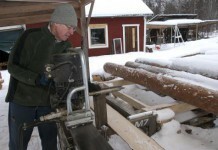 Many times their own sawmills have been the solution when the three boat builders have not been able to obtain the right building material through the usual channels. 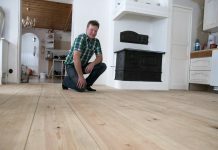 Finding tropical wood of the right quality and sufficient width has become harder and harder, which is primarily a problem when renovating and the new wood is supposed to agree with the old. 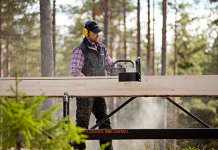 When it comes to bigger renovations or superstructures the possibilities are to be found in the Swedish woods, if you can do your own sawing. ”I don’t think we need to be ashamed of Swedish elm at all,” says Johan and shows us a shining varnished door made of a type of wood, which to the untrained eye looks as coming from the tropics. The raw material is the basis of marine quality, and this is obvious when looking at the work done by ‘Båthantverkarna’. Dense, quarter-sawn, knot-free and well-seasoned. The last named quality is obtained by using a Sauno kiln from Logosol, which is placed on one short side of the boat hall. In winter, it has dual functions. Besides drying the timber, it also contributes to the heating of the building and acts as a humidifier. The Sauno kiln uses moisture in the drying process. To a boat builder this is nothing odd. At all times, steam has been used for softening timber before bending it, and when drying timber. ”The steam opens up the pores and makes it easier for the wood to dry,” Johan explains. 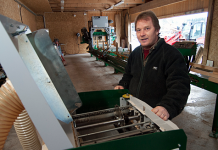 The boat builders’ latest investment is a two-sided planer/moulder. 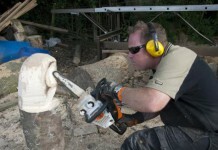 It replaces an older planer, and will also be used as such. What they need is a planing width of as much as 410 mm. The side cutter is a bonus, and in the future it will make it possible for the boat builders to produce their own mouldings, using the timber they themselves have sawn, to be used both on land and at sea.